At Dr. Greene’s Plastic Surgery and Laser Center, our Physician Assistant, Holly Rafferty, performs all laser hair removal treatments. Holly has been trained and certified by Cynosure and is highly experienced. She takes pride in delivering the highest quality of care and her priority is patient safety and comfort. 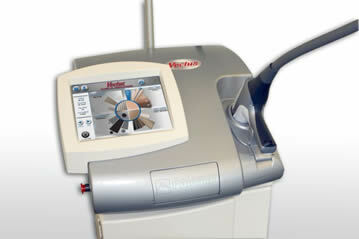 We use the Vectus laser by Cynosure, which is the newest and most advanced laser hair removal treatment. The Vectus provides high-volume permanent hair reduction for any skin type – without sacrificing patient comfort and with ensured safety. Performed by our PA Holly at our Weston Florida office. "I have struggled with unwanted hair my entire life. After trying nearly everything out there to remove the hair, I finally met Dr. Greene and his amazing team. This laser treatment has been the only effective and pain free solution to my life long struggle. I couldn't be happier with the results. The Vectus is LIFE CHANGING!" At GreeneMD we have established a Laser Center of Excellence that delivers the most cutting-edge laser treatments available to our patients. As leading experts in laser and light technology, Dr. Ryan Greene and Holly Rafferty, PA-C offer the highest level of care with his aesthetic laser treatments. Not all laser hair removal clinics are the same. Many are medical practices or ‘medical spas’ that have poor supervision and treatments delivered by inexperienced staff. At Dr. Greene’s Plastic Surgery and Laser Center, our Physician Assistant, Holly Rafferty, performs all treatments in the center. Holly has been trained and certified by Cynosure and is highly experienced with the most advanced laser technology. Treatments are only performed after a consultation, evaluation, and test treatment of the area. As one of the most respected medical offices, our reputation for quality care and safety is founded on proven experience. The hair pigment (i.e. color) absorbs the optical laser and radiofrequency energies, converting these energies into heat that permanently destroys or injures the hair follicle, thus making it unable to continue to grow hair. Because not all hair is in the growing phase at the same time, a series of treatments is necessary to achieve long-term hair reduction. Laser treatments are repeated every 4-8 weeks depending on the area being treated. 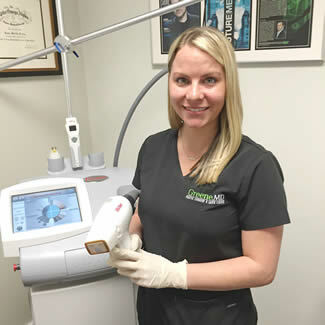 On your first visit, our Physician Assistant, Holly Rafferty, will review your medical history and determine if laser hair removal is right for you. Some patients start their first laser hair removal treatment on the same day as their initial consultation. Any area on the body can be treated in less than 5 minutes and there is no numbing or anesthesia required. Because the laser tends to treat hair follicles that are in the active growth phase, anywhere from 6-8 treatments may be required. This varies among individuals as well as the particular body area. Do you offer any packages for laser hair removal? Since laser hair removal requires multiple treatments, we offer special pricing packages for any treatment area. We also offer special combination packages for patients who are interested in treating multiple areas at once. We offer competitive pricing consistent with …. Laser hair removal can cause minimal discomfort, but is tolerable by patients. Our Vectus Laser Hair Removal Device has a cooling tip, which provides more comfort compared to other devices. In rare cases where a patient has a low tolerance for pain, a numbing cream can be used on the skin. Does the Vectus Device work on tanned or different skin colors? Yes. This device can safely and effectively treat all skin types. The number of laser hair removal treatments depends on the area treated, hair type and previous hair removal methods. Typically, 6-8 treatments are required, although patients with lighter hair may require more treatments. An inadequate number of treatments will result in a lower rate of effectiveness; therefore, adhering to a schedule is necessary.